While living in Thailand in the early 60’s, I bought a book on Buddha put out by the Buddhist Society of Ceylon, as I recall. Recently I wanted to find a copy. 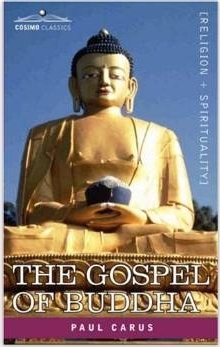 I finally found a translation by Paul Carus, The Gospel of Buddha Paperback, that matched my version of Buddha’s four noble truths word-for-word so figured that was my long lost book, although, parts of the eight-fold path oddly differed. The differences strike me as profound, especially in how the seventh and eighth ‘fold’ relate so directly to the Tao Te Ching. This is the eight-fold path that I learned from that book in 1964: Right Understanding, Right Mindfulness, Right Speech, Right Action, Right Livelihood, Right Effort, Right Attentiveness, and Right Concentration. In the edition I found online, they state, “This is a pre-1923 historical reproduction that was curated for quality.” This may account for the differences I noticed in the eight-fold path. I list below the four major differences I found in this pre-1923 edition. The three in bold I consider very significant improvements to what I’ve been pondering all these years. One difficulty I’ve long had was distinguishing a practical difference between “mindfulness”, “attentiveness”, and “concentration”. I have read longer commentaries on the eight-fold path, but nothing really clarified this. If anything, more words can obfuscate the simple truth. What’s more, I never came across anything that was better than what I had… until now (1). How close are these or any others to the original Sanskrit in which they were first written? Based on my experience translating the Tao Te Ching, I’d assume that the original has many meanings due to synonyms and partial synonyms. It rests upon one’s own mind and experience to determine the ‘right’ meaning. Not inclined to learn Sanskrit, I’ll just have to play it by ear, and follow Buddha’s advice to rely on my own experience (2). The first “Right”, Right Understanding isn’t significantly different from Right comprehension. The other three are a different story: Right Resolution, Right Thought, and Right State of Peaceful Mind. It is easy to see how everything rests on one’s understanding. Our personal comprehension of the world sets the stage for every aspect of our life. Next is the importance of Right Resolution. This directs our will to walk the walk, not simply talk the talk that arises from our comprehension of life. Right Thought is the weakest link in all this as I see it. That is because our primary emotions drive thinking and skew judgment to support the ego’s agenda. That means fear and need are in the driver seat most of the time. See Fear & Need Born in Nothing for a deeper look at this aspect. The eighth fold of Buddha’s path is the ultimate human quest, Right State of Peaceful Mind. Although, I assume many would disagree. They will claim how much they enjoy challenges, the rush of excitement, and the pleasures of success. I have no argument there; this is how the bio hoodwink hooks. The bio-illusion that we can catch our tail drives us to chase our tail relentlessly. Our underlying hope lies in our dreams of success and ultimate satisfaction. Once achieved, we strongly feel that peace will be at hand. Of course, any success or peace we find evaporates before we know it; that’s why I call it the bio-hoodwink. Buddha’s Four Nobel Truths are the most succinct account of this natural process. To the extent we ponder and remember their thrust, these truths can help us avoid some of the extreme pitfalls of the bio-hoodwink. Naturally, the proof of this lies in the pudding of one’s own life. There is something strange about various editions of Paul Carus’s book, including many of the Kindle editions of this text available through Amazon. In the EBook of the Gospel of Buddha, you’ll see the four noble truths mentioned, but for some reason they are truncated. On the other hand, the print version I have (The Gospel of Buddha Paperback) has the full text of these truths. Were there different printings? Still, I find it unthinkable that they would omit the most important part of chapter XII Enlightenment, which contains the concise, yet complete text of Buddha’s Four Noble Truths. I think it fitting to wrap this up with the Fourth Noble Truth and the Eight-fold path. Eight steps on the Middle Path are: (1) Right Comprehension; (2) Right Resolution; (3) Right Speech; (4) Right Action; (5) Right Living; (6) Right Effort; (7) Right Thought; (8) Right State of Peaceful Mind. A few questions arise for some folks. For example, what is “duty” and what is “right”? First, duty is not what other people or one’s culture touts. One way to describe duty goes like this: Hurry up and do what you want to postpone; Delay what you want to hurry up and do. When the two poles are almost indistinguishable, then you are close to doing your duty. I suspect we all know in our heart of hearts where our personal duty — our self-integrity — lies. Our emotions just thwart our best intentions. What is “Right”? About 20 years ago, somebody asked me what the “Right” meant. At the time, I said you have no chance opening a jar by turning its cap clockwise. Counterclockwise is the “Right” way to open it. Now I can update that since I see there is more (or less) to this. Put simply, we can’t understand what we don’t know. (See We only understand what we already know). Of course, something will make sense and we’ll readily think we understand. This delusion parallels chapter 71’s counsel on thinking. We are actually only able to understand that which we are ready to hear (i.e., intuitively know). The natural beauty here is that over the years, life experience helps us realize what is ‘Right’ in each particular ‘fold’, i.e., Right Comprehension; Right Resolution; Right Speech, etcetera. In short, we never cease ‘growing up’. The nature of Right unfolds as self-understanding deepens. However, at any moment in time, we do know the deeper Right for us than our actions are able to express. Need and fear throw up roadblocks constantly. The trick is to accept we are doing the best we can with what we have, and that what we have is always more than we need. As chapter 46 says, Therefore, in being contented with one’s lot, enough is usually enough indeed. (1) Admittedly, the reason I never came across anything more spot-on might be due to the uncomfortable ‘truth’ that we can only understand what we already intuitively know. If so, then perhaps I just wasn’t ready to see. (2) Just in case you wish to see the Sanskrit, this is from the “The Buddha And His Teachings”, by Venerable Nárada Maháthera, and published by the, Kandy, Sri Lanka. Buddhist Publication Society. Thank you, well written, and enjoyed seeing the sanskrit.